A bond is a security, which unlike shares, provides its owners with a predetermined financial return. By purchasing the bonds, you grant a loan to the issuer, and he undertakes to pay you the interest until the maturity of the bonds. At the end of this period, the investor will get back the amount with which he has bought the bonds, plus fixed interest rate that has been determined in advance. 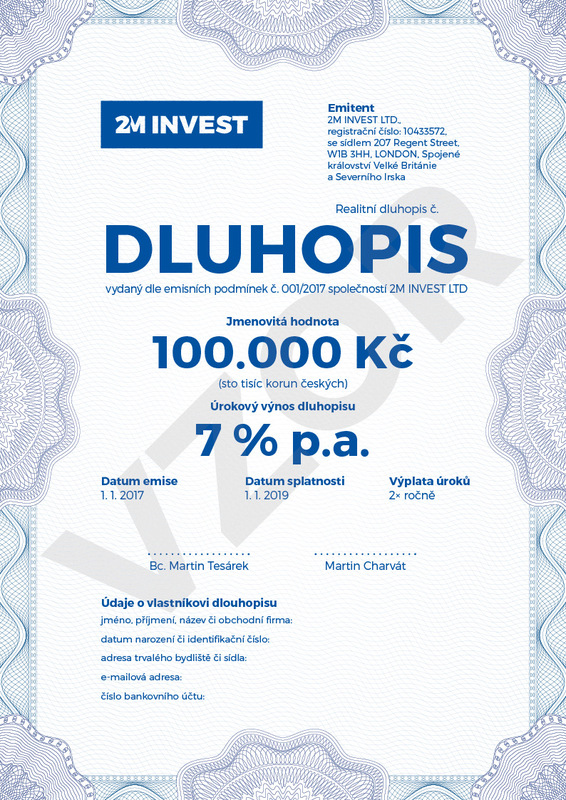 Our real estate bonds were issued to finance the purchase of new development projects. We only invest in real estate. We are looking for real estate in regions we know well: Prague, Central Bohemia, and Vysočina Region. We are interested in properties that are overlooked by others. We add value to these properties, either by reconstructing or renting them out, by creating an investment history with a yield above 9% per annum. Then we sell them as investment opportunities to investors. While renovating real estate, we cooperate with the architectural office BOQ ARCHITECTS, which provides our reconstructed real estates with high value and style. The information and documents in this section are intended only for holders of bonds issued by 2M INVEST LTD. It cannot be considered as an offer or recommendation to purchase, or sale of these bonds, which are intended for a limited number of persons.